Most new jobs in the modern economy will be heavily influenced by technology. According to the U.S. Bureau of Labor Statistics, career opportunities for MIS professionals are expected to expand rapidly from 2014-2024 due to a greater emphasis on cloud computing, the collection and storage of big data, more everyday items becoming connected to the Internet in what is commonly referred to as the “Internet of things,” and the continued demand for mobile computing. High salaries. According to the U.S. Bureau of Labor Statistics, the median salary for high-level information technology managers was $127,640 in 2014. 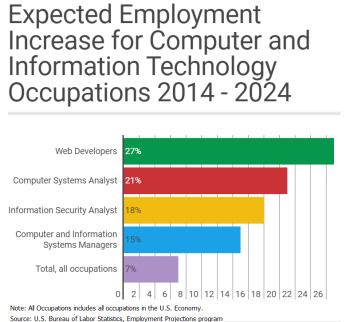 Employment within computer and information technology occupations, including computer systems analysts, information security analysts and other computer professionals, is expected to increase up to 12 percent by 2024 (U.S. Bureau of Labor Statistics). Seven of the top 20 jobs listed in “Best jobs in America” in 2015 are IT related (CNN Money). 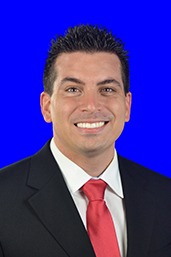 FAU ITOM graduates are trained and qualified for these types of jobs. Computer Systems Analyst is ranked #3 in the 100 Best Jobs of 2016 as ranked by US News and World Report. In academic year 2015-2016 for FAU's College of Business undergraduate majors, Management Information Systems was tied with Accounting for the highest percentage of graduates (71% of graduates) employed full-time after graduation (FL Dept. of Education). Jobs and careers in IT continue to be in high demand. Below is a list of recent media coverage about the demand for IT skills. What Can I Do To Find a Great Job? Start now! Don't wait until you are a graduating senior! The ITOM Department has comprehensive connections with MIS alumni and local corporations. We invite guest speakers to classes, have annual ITOM events, panel discussions, and networking sessions with alumni that are geared towards helping you find a job. Industry leaders regularly give information sessions to our students about job prospects. We offer company projects and internships (including for course credit!). It is never too early to start attending the informational sessions that our department offers. Juniors should get to know the companies that recruit MIS graduates. Seniors should aggressively seek opportunities everywhere. Talk to your MIS professors! We are here to help you and answer your questions!